Did Neotropical snails occur in Africa and Europe? Fossils allow us a peek into the past, and although a lot remains uncertain and sometimes highly speculative (no molecules but only shell morphology to start with), they offer sometimes challenging views on worlds that have gone. What we now call the Neotropics possibly once had a wider extension, and a team of Algerian and European scientists have made a study of Algerian shells that possibly give a clue. Hammouda et al. (2017) present a review of Eocene “Bulimes” and reached interesting but still tentative results. Their abstract reads “Terrestrial gastropods occur in many North African localities in Eocene continental deposits. Here we analyse the faunal assemblage from the Hamada de Meridja Formation in southwestern Algeria, dated as Early to Middle Eocene on the basis of charophytes. The assemblage consists of three closely related species that to date have been classiﬁed either in the extant Madagascan genus Leucotaenius v. Martens, 1860, or in the SW European Eocene genera Romanella Jodot, 1957 and Vicentinia Jodot, 1957. This is rejected for shell morphological and phylogeographical reasons, and a new classiﬁcation as Maghrebiola gen. nov. is proposed. 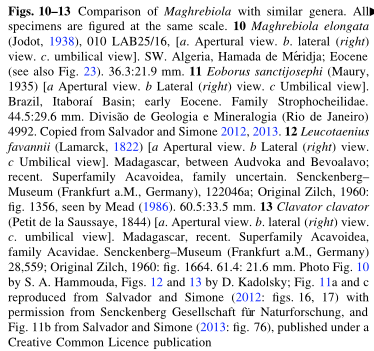 Maghrebiola is tentatively placed in the South American family Strophocheilidae, as species from the Early Eocene Itaboraı Basin of Brazil, currently placed in the genus Eoborus Klappenbach and Olazarri, 1970 in the family Strophocheilidae, superfamily Acavoidea, have a very similar shell habitus. This record possibly extends the known geographical range of the Strophocheilidae into the African continent during the Eocene. Immigration of this stock into North Africa during the Cretaceous via a still existing plate connection is assumed. 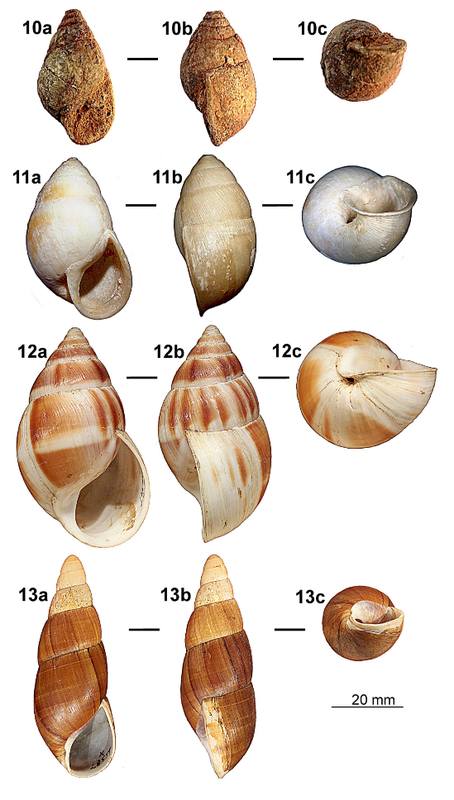 An attribution of Maghrebiola to the African family Achatinidae is unlikely for shell morphological reasons despite certain habitus similarities, although the Priabonian genera Arabicolaria and Pacaudiella from Oman most likely belong into this family, and not to the Vidaliellidae as originally proposed. Possible causes for the very low diversity of the assemblage are mainly unfavourable living conditions, i.e. a relatively dry climate resulting in sparse vegetation and only occasional presence of water bodies, which may have had increased salinities, accounting for the lack of freshwater mollusks. The absence of any competing large gastropods may possibly have facilitated high intraspeciﬁc variability leading to sympatric occurrence of three closely related species, due to the animals occupying a wide range of available ecological niches. 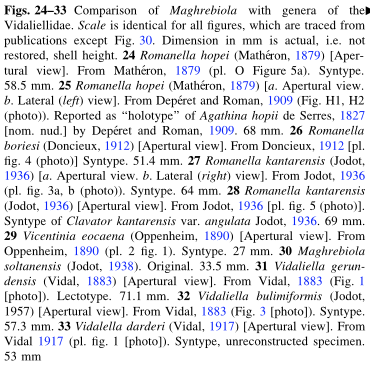 As the species discussed here have also been attributed to the genera Romanella and Vicentinia in the Vidaliellidae, we provide an appendix with annotated characterisations of most genera of the Vidaliellidae and list the nominal species assigned to them. This family is tentatively placed in the South American superfamily Orthalicoidea; its stock would have similarly immigrated from South America, but have successfully colonized mainly SW Europe, with only one Eocene species [Romanella kantarensis (Jodot, 1936)] recognized in Algeria”. 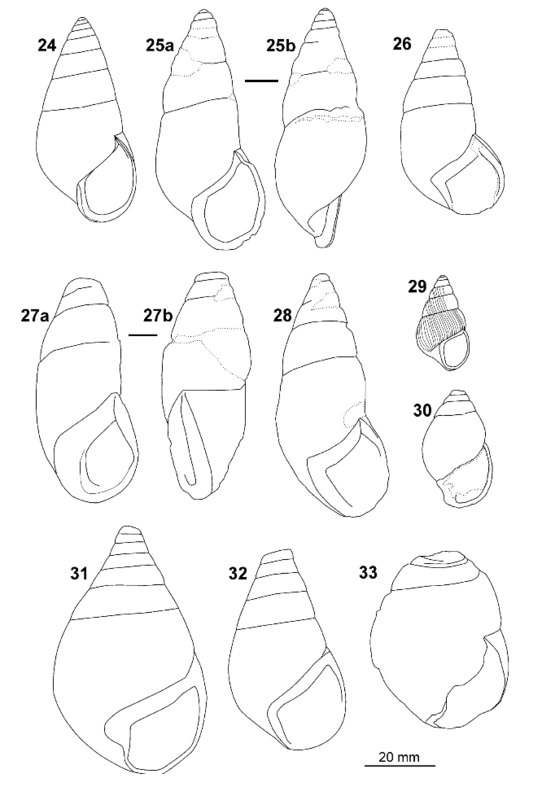 The most recent, total overview of fossil and Recent Gastropoda was by Zilch, who classified the genera Romanella and Vidaliella with others in the “?Familia Anadromidae” within the Bulimulacea [currently Orthalicoidea] (Zilch, 1960); these genera are now placed in a family on their own, but based on their morphology there might be a resemblance with the Megaspiridae (e.g. Thaumastus). The link between the Mediterranean area and South America is further shown in the presence of the Clausiliid Neniinae, which the authors use as one of their arguments for their grouping of Maghrebiola with the Strophocheilidae. All this is an interesting but not implausible hypothesis. Zilch, A., 1960. Gastropoda 2. Euthyneura. In: Schindewolf, O. (ed.) Handbuch der Paläozoologie, 6 (3–4): 401–834. Berlin: Borntraeger. This entry was posted in Uncategorized and tagged Africa, europe, fossil, literature, orthalicoidea, paleogeography, strophocheilidae, types on February 13, 2017 by bramb.